The FlyBoard is an exhilarating sensation of human flight without the extensive training, uncomfortable gear, or unnecessary risks! Soar over the water like Iron Man, quickly, safely & easily! Book this is a 60-Minutes session for yourself, or 30-minutes each for two. Book with low rates, group discounts and real time availability on our website at nashvilleflyboard.com. 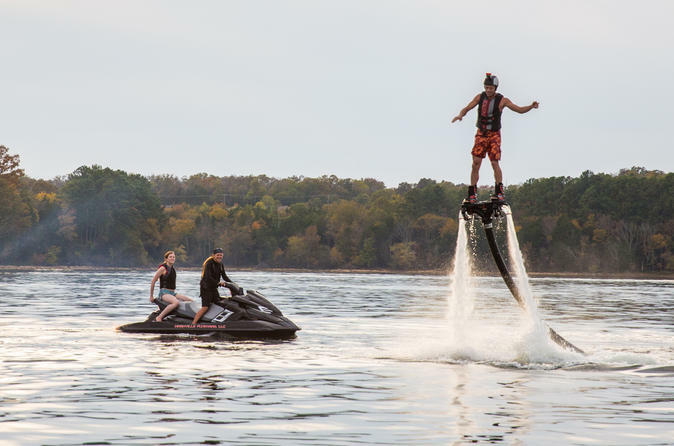 Nashville FlyBoard is located just 15 minutes from downtown Nashville with a private dock inside Nashville Shores Water Park and Cap'n Dave's Jet Ski Rentals. All flights include an intro lesson, a top of the line jet ski, your choice of the FlyBoard, Hoverboard or JetPack, and an experienced Certified Instructor to guide you through your entire session. Bring yourself and a friend for this mind altering experience of flying like you've only ever dreamed! Departing from Percy Priest Lake in Nashville, meet us at our dock Inside Nashville Shores Water Park. You will get to try the FlyBoard or Hoverboard by ZR at the recreational lake of your choice. Nashville Flyboard offers the official Zapata Racing Flyboard, Hoverboard by ZR, and ZR JetPack for sales and rentals for any type of event. Our Flyboard professionals will bring all the equipment you and your group need, give you a short intro lesson, and meet you at the lake to have you Flyboarding in no time! You'll be guided through every step of your FlyBoard session to have you surfing the skies safely, and quickly! Our service areas include Percy Priest Lake, Center Hill Lake, Tims Ford Lake, Dale Hollow Lake, Old Hickory Lake, and more. We're also available for private parties, media events, demos, and more. An authorized dealer for Zapata Racing, Nashville FlyBoard is Tennessee's Premier Destination for the FlyBoard and Hoverboard by ZR. We guarantee you a safe, fun, adrenaline pumping experience that you'll never forget!